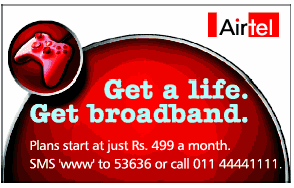 Airtel has launched its new 16 Mbps Broadband Plan for high speed internet access. The service will be initially available in Delhi NCR, Chennai and Bangalore, and will be moved on to the rest of the cities in the next phase. Speed Combo 2999 – 16 Mbps Broadband speed with monthly data transfer limit of 20 GB along with a fixed line connection at Rs. 2999 per month. Speed Combo 4999 – 16 Mbps broadband speed with monthly data transfer limit of 50 GB along with a fixed line connection at Rs. 4999 per month.